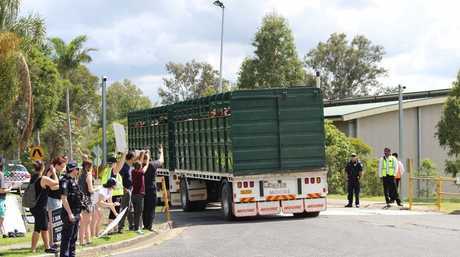 Protestors try to stop cattle truck. UPDATE 2PM: DRAMATIC footage and pictures have emerged of an animal rights activist group's 'vigil' at a Dinmore meat processing plant. Members of the Brisbane Animal Save group, which is part of Animal Liberation Queensland, held up signs that read 'stop killing animals' metres from the front grill of a B-Double truck delivering cattle on January 30. In the footage, the truck braked and stopped to avoid colliding with the activists while others rushed to the side of the truck and took photos and video of the animals with selfie-sticks. A JBS spokesperson said the activity was a distraction for the industry and similar 'vegan protests' had been happening around the country. A Queensland Police spokesperson said officers attended the protest but nobody was arrested and there were no offences. "(Protesting) is an important right in society but by the same token we can't have people interfering with the free movement of traffic and people going about their business," the spokesperson said. INITIAL: FOOTAGE and pictures have emerged of an animal rights activist group's 'vigil' at a Dinmore meat processing plant. 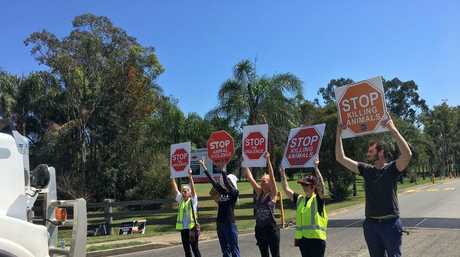 Members of the Brisbane Animal Save group, which is part of Animal Liberation Queensland, held up signs that read 'Stop killing animals' centimetres from the front grill of a B-Double truck delivering cattle on January 30. A representative of the group said they went to the site to 'spend a few moments with the animals'. Their actions have been met with a barrage of abuse on social media.